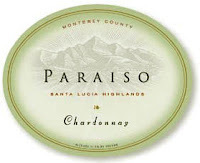 A Chardonnay from the Santa Lucia Highlands that is showing very nicely. Aromas of creamy lemon pie, soft french oak, candied spice, and a pinch of nutmeg. The flavors are very nice and round and show hints of some soft citrus, creamy cinnamon-nutmeg, and oak, followed by a good crisp acidity on the finish. Balance is the key to this wine because although the wine is soft and has a creamy like texture, the acidity is bright on the finish and will help the wine pair well with foods. I score this wine 88 points and recommend it because of the great quality to price ratio.